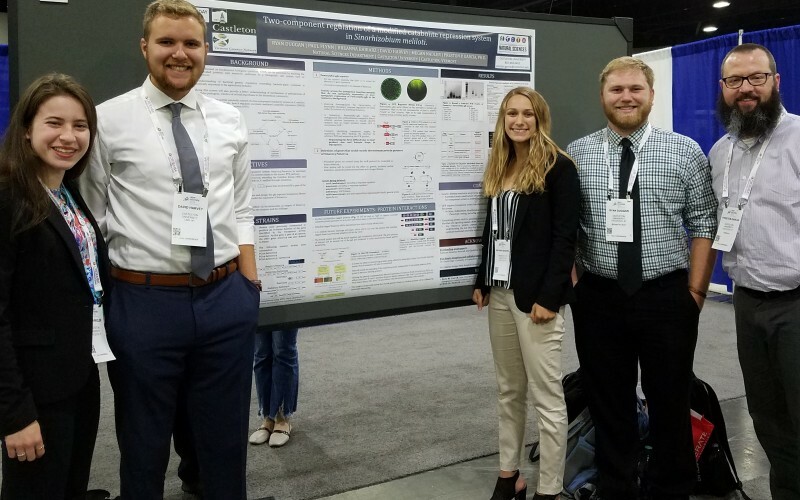 Pictured above: The Garcia lab, (L to R), undergraduates Megan Nadler, David Harvey, Breanna Babiarz and Ryan Duggan presenting their grant-funded research at the American Society for Microbiology Microbe 2018 meeting in Atlanta, GA.
Castleton University Associate Professor of Biology and Biology Program Coordinator, Dr. Preston P. Garcia (pictured above, far right), has secured a competitive research grant through the National Science Foundation (NSF) which will fund his research until 2021. The grant entitled "RUI: Collaborative Research: Understanding the role of a modified phosphotransferase system and a unique two-component signal transduction system in regulating gene expression.," is under the direction of Dr. Garcia at Castleton, in collaboration with Dr. Catalina Arango Pinedo at St Joseph's University in Philadelphia, Pa. The collaborative grant total amount is for $560,082, with $252,071 going to St. Joseph's University and $308,011 going to Castleton University. "Dr. Arango Pindeo and I are excited that our proposal was well reviewed by our peers and was awarded funding. Competing with scientists at research schools across the United States for this funding validates the hard work we have done to establish our science department at Castleton as one that provides students with the same research experiences as larger research-focused schools. With financial support to pay up to 12 Castleton students and six local high school students, we can continue to train students in cutting-edge research." Dr. Garcia's efforts to grow research opportunities at Castleton have impacted 11 independent research students and resulted in over $330,000 grant dollars since he arrived at Castleton. In sum, the faculty in the Natural Sciences Department at Castleton have now received more than $1 million to fund research opportunities in microbial metabolism and genetics, plant evolutionary genetics, animal behavior, structural geology, environmental chemistry, and biochemistry for their students since 2010. The department is a baccalaureate partner institution in the NIH-INBRE Vermont Genetics Network (VGN), which provides support for students and faculty members conducting biomedical related research through the University of Vermont. According to Dr. Garcia, this NSF funding would not be possible without the financial and professional support from the Vermont Genetics Network. "The goal of VGN is to have research faculty 'graduate' to independent federal funding, which I have now done. I would not have had the data or grant writing skills to be competitive for federal funding without VGN." Dr. Garcia's research is focused on bacteria which have the ability to directly sense their environment and change their behavior according to their surroundings. While these changes can be seen visually, the intricate genetic processes that lead to the changes are not fully understood. This project will investigate some of the ways in which bacteria carry out these processes using Sinorhizobium meliloti as a model. Sinorhizobium meliloti is a member of a larger group of bacteria called rhizobia, and is environmentally and economically vital in the field of agriculture. Sinorhizobium beneficially infects legumes and provides useable nitrogen to increase crop yield. An efficient and productive rhizobium infection reduces the need for chemical fertilizers. Expanding our knowledge of the genetic systems that control the behavior of this bacterium has the potential to allow manipulation to optimize the rhizobium-plant interaction. According to Garcia, the research will allow students to explore the scientific methods and communicate findings properly. "To effectively conduct research across educational levels ranging from high school to graduate school is a great opportunity for all involved. Our research will help to answer fundamental biological questions about bacterial communication, especially how bacteria beneficially infect plants, which has direct impacts on the agricultural industry." Castleton research students will participate in the New England Workshop on Symbiosis focused on the specific symbiotic legume/bacterial relationship being studied by the Garcia lab. This workshop is attended by faculty and students from UVM, UMass-Amherst, Eastern Connecticut, UConn, MIT, Castleton, and St. Joseph's (Pa.), further exposing Castleton undergraduates to the wider scientific community. The grant also provides funding for a new Castleton course, Special Topics in Biology: Bacterial Proteomic Design & Analysis, which will achieve multiple goals including further strengthening the mission of the department to provide student training in research while also increasing the involvement of faculty in competitive research by utilizing Dr. Garcia's bacterial research samples as the basis for the data collection. The students will gain the theoretical background information at Castleton while performing the laboratory work at UVM. The UVM arrangement will allow the Castleton students to participate in hands-on research techniques and utilize equipment at an R1 research institution. Undergraduate research students will also receive meaningful public outreach training by producing an outreach product at the end of each summer session, in the form of a podcast, video, poster, or informational fact sheet about their summer research. The outreach products will be produced and disseminated to secondary students in Vermont, facilitating collaboration between Castleton and secondary biology educators statewide. The undergraduate students on the project will also share their research experiences and outreach projects with students and faculty at St. Joseph's University and Castleton and aid in the delivery of the science lessons, including a laboratory activity, for ninth and tenth graders in Philadelphia. "This is more than just sitting in the lab performing experiments," Garcia said. "Independent research is about discovery and learning how to critically think, but also sharing this information in an accessible way with the public. Public outreach is part of our duty as scientists, to share our knowledge." Research reported in this release is supported by funds include support for "Division of Molecular and Cellular Biosciences: Investigator-Initiated Research Projects (MCB)" in accordance with the NSF Program Solicitation, NSF 17-589. Funds provided by this award include support in accordance with NSF program solicitation 14-579, "Facilitating Research at Primarily Undergraduate Institutions: Research in Undergraduate Institutions (RUI) and Research Opportunity Awards (ROA)".